I've uploaded my rental agreement, and would like to add custom fields for guests to complete prior to signing the agreement. (For example, I require the names and ages of all guests in the house). Could someone walk me through this process? Thanks so much! In this case, make it a "rich text" type (which will make it multi line) and make it required. In the field description, tell the guest to enter name and age, one per line. Then go to the renter agreement ( legal agreements section in settings) and use the Insert Field button to add it. Thank you! What should I put in the Merge Code box? The code is what you'll pick in the Insert Field dialog to reference it in the legal agreement. The name is the human readable label.on The code is for the merge engine to reference. Put something like GUESTLIST - you'll see how it works once you get to the Insert Field step.. Cool. Noticed you're making some fields for other things like State and Phone. Most of those should be already collected at checkout - it's usually the guest list you need the custom field for. To see how checkout looks for the guest, first go to Settings > Payment Methods and add one so you can go through checkout. A check method is is easy, and you can turn it off later if you don't want to take checks. Then go to Quotes and create a test one. Use the Payment Form link and that will take you to the checkout that the guest will see. The checkout fields are collected before the renter agreement, just for that reason -- so they can be included in the agreement. We don't have a way to validate number of people on checkout, other than adding a required field where they type the number of guests again -- that may actually be the best way. Add a field called "confirm number of guests", require it, and then check that against the number of guests on the quote. Problem with an actual number that would go into the guests field is that many amounts are based on number of guests with guest fees etc. But if you're checking the confirm field, you can then update the charges to match and send them another sign link from the booking. The legal agreement prepopulates with the contact name from the contact info checkout step. Are they missing that and then just clicking next...next...next? I suppose I could see that, but what about the other side -- do you validate that the signing name matches the contact name or the billing name, and if so, what if they're different. Good call on the blanking of the signing name -- we just pushed up a hotfix to do that and add a signature message. I just had a situation when one person (say Jane Doe) booked via VRBO. So I import her booking into OR and trigger email with link to rental agreement for her to e sign. . Then i look in my VRBO dash and I see that payment was made by another individual form her group ( Say Sam Smith). So Now I have Jane Does signing the RA abut Sam Smith paying. I ask her for Sam's email, resend the rental agreement to Sam, but even then the Name field on the bottom is pre populated with Jane Does's name - although editable,. he just clicked next next net and signed as Jane Doe. because nothing forces him to validate his name. But that is outside booking, Ideally, on OR bookings I would like to match the name of the person on the rental agreement to name of payer, but not sure it is doable. or at least to make the name blank (as above) so that they are forced to enter it on the bottom of the agreement before proceeding . Is that what hotfix was for? Yep, the hotfix did the blanking. Have a look at the sign link for that booking now. The name will now be blank and you'll see the additional signing note at the bottom. That way when Sam Spade goes to sign, he'll have to put in his name or get an error. He could still put in the wrong name on purpose, but won't do it by accident. yes this is better. However I cannot embed his name in the body of the document can I . 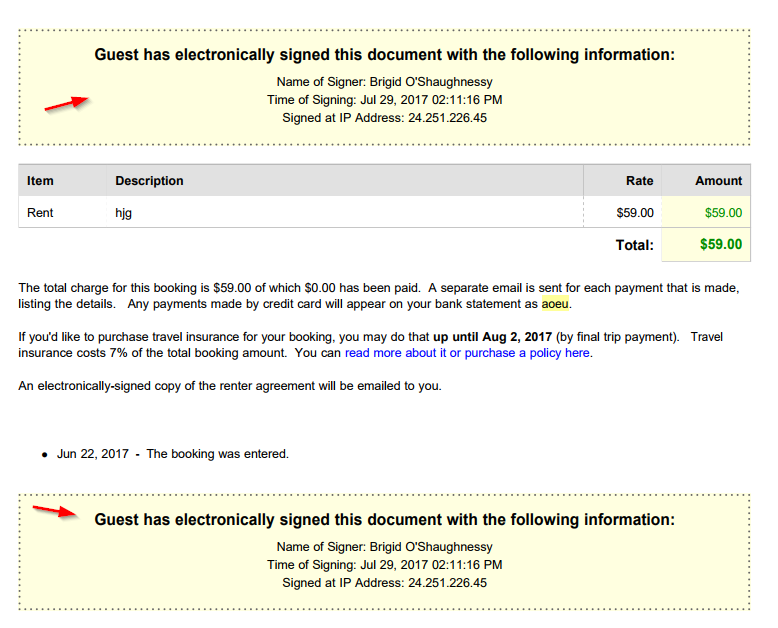 Like "I, [ require typed name] understand and agree to the hot tub use waiver .. " , can I? 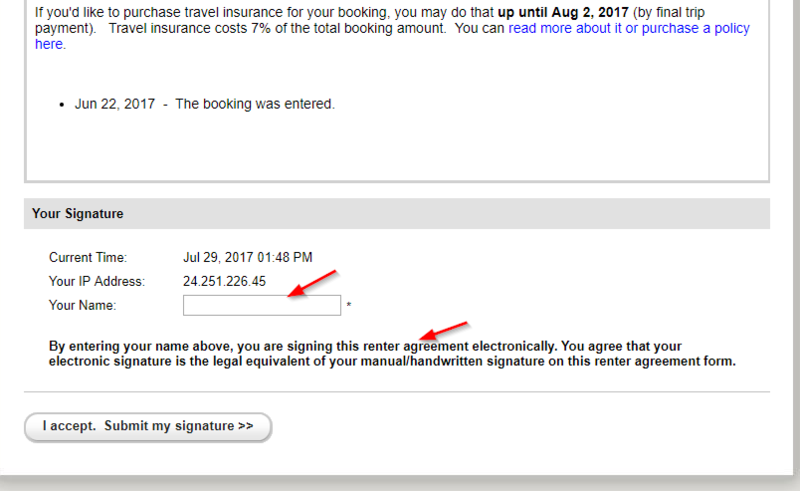 No, you can reference the guest name in the agreement, but the signing name isn't known until after the agreement is rendered. Instead, it's stamped at the top and the bottom with their name and signature (see below). Can you reference the signatory, undersigned, etc.? Eventually we'll add something where you can break the agreement into sections and require initialing of each one separately, but that's a more complex process to have multiple sections, sign, then stitch them back together. Yes , that is what I did - put "undersigned" instead of name. Thanks a lot! This is what I'm looking for! Currently, my guests are required to click through and initial after each section of our rental agreement. Thank you for all your help. Great customer service with OwnerRez!